Are you looking for the best Outdoor Bluetooth speakers? You are already at a right webpage on the internet. Here you will get the list of best outdoor Bluetooth speakers that are a portable wireless speaker that can become your best companion on almost any of the adventurous trips. These outdoor Bluetooth speakers beat every norm in terms of sound, durability, portability, connectivity options. The below-mentioned Wireless Bluetooth speakers are waterproof, dustproof (not all) which are designed to endure your adventurous trips and still delivers the powerful and punchy sound with deep bass parts. JBL Flip 4 is one of the best Outdoor Bluetooth speakers when it comes to design, sound quality & durability. The JBL Flip 4 is IPX7 certified that means you don’t need to worry about JBL Flip 4 Bluetooth speaker on water spills or in rain. You can also submerge the speaker in water. For longer parties, JBL Flip 4 comes with built-in 3,000mAh battery that provides the juice for 12 hours which is indeed a great thing for a Bluetooth speaker. For outstanding bass, JBL has provided Dual external passive radiators on both the ends of the Bluetooth speaker which produces deep and really powerful bass even in outdoors. Moreover, with JBL Connect+ feature, you can connect up to 100 JBL Connect+ speakers for amplifying the sound. Along with that, you can connect up to 2 devices with the JBL Flip 4 for wireless streaming of music. 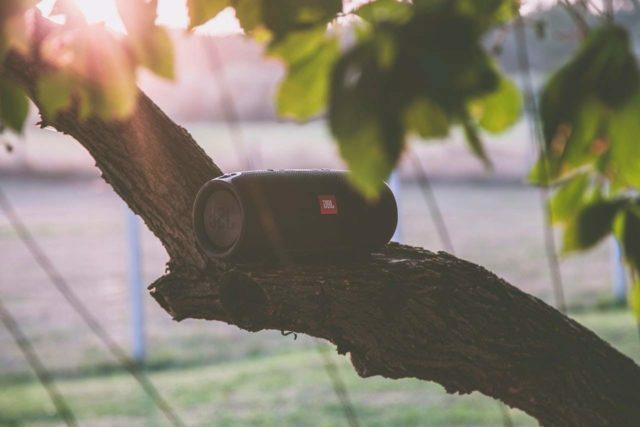 JBL Flip 4 is available in 8 attractive colors and without any doubt, is one of the best outdoor Bluetooth speakers you can buy for your next adventurous trip. Okay, straight answer. Looking for the most durable outdoor Bluetooth speaker with the long battery life? Vtin Outdoor Bluetooth Speaker is all you need. Here is why? First thing first, this 20W bad boy has 4,400mAh inbuilt battery which will provide you juice for 30 hours (at 70% volume) which happens to be just perfect for picnics, family functions, hiking, campfire parties and what not. 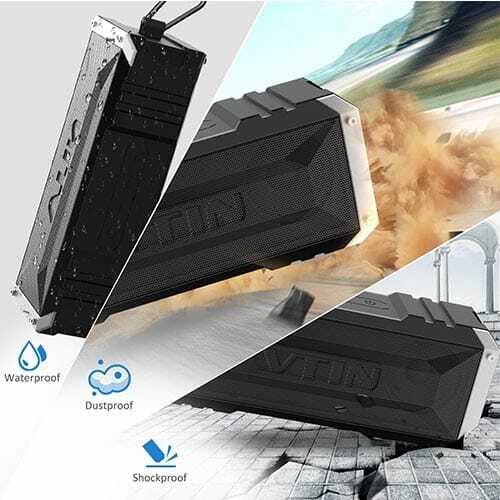 Another great thing about Vtin Outdoor Bluetooth speaker is IPX4 rating which makes it waterproof, dustproof, splash proof, shockproof. Doesn’t matter if you are at beach, rain, pool, this Bluetooth speaker will take care of itself while you are enjoying your playlist. Talking about sound, it sounds pretty good with great mids and highs without distortion. The sound produced by Vtin Outdoor Bluetooth Speaker is immersive, crisp & clear. The bass part is not that strong but considering its durability and battery life, we can negotiate with that. The Bass part is not that bad also, I mean you will get the deep beats. The Vtin Outdoor Bluetooth speaker can be easily connected via Bluetooth to Android phones, iPhone, iPad, Computer/Laptop. There is also AUX option if you wanna save a little bit of battery. For durability and compatibility, Vtin is best outdoor bluetooth speaker. Worth considering. Here is another outdoor Bluetooth speaker which is Eveready for the adventurous trips. The Braven BRV-X comes with an IPX7 rating which makes it waterproof and shockproof. Its rugged design is made for outdoors and you can carry it anywhere without even taking care of it from water splashes, rain. You can emerge the speaker in the water but for less than 30 minutes to the depth of less than 1 meters. One great feature which is attracting is its massive battery. BRV-X comes with 5,200mAh battery which you can use it as Powerbank to charge your smartphones. If durability and battery is your need, you can consider it but for sound, it is not that great. If you are an avid music listener who wants to experience every instrument playing in the song and needs thumping and dense bass, it is not for you. For outdoors and durability, yes, it does a great job. 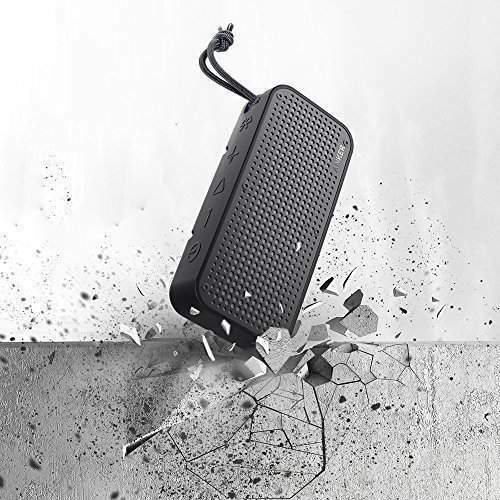 Are you looking for a durable Bluetooth speaker that can survive the tough circumstances and also sounds great with deep and dense bass? OontZ Angle 3 ULTRA is for you my friend. The Angle 3 Ultra comes with Dual Precision Stereo Woofers placed under the grille which deliver the rich and deep bass. 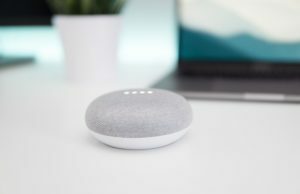 You can connect almost any device having Bluetooth compatibility including iPhone, Android Smartphones/Tablets, Laptops, Kindle, Amazon Echo, Echo Dot etc. with Angle 3 to an extent of 100 unobstructed feet. The built-in 4,400mAh battery provides you juice for 20 hours. The Angle 3 comes with an IPX6 rating which makes it splash proof and rain proof. You can easily carry it to beaches, Golf courses, Pool, rain. To me, this Oontz Angle 3 Ultra outdoor Bluetooth speaker by Cambridge Soundworks is a value for money product and worth considering it. For all the music lovers who are looking for a great sounding and durable Bluetooth speaker in the budget, this is indeed for you. HyperGear Beast XL is a tough boy. How? Here it is. The Beast XL comes with 5 Dynamic Drivers, 2 Passive Bass Radiators, 2 Acoustic Tweeters, 1 Powerful Subwoofer, and Anti-Distortion Circuitry and all this packed in a small, portable outdoor Bluetooth speaker. You will get some real Bass with this Outdoor Bluetooth speaker. Along with that, you can enjoy mesmerizing acoustic sound with perfect mids and highs. 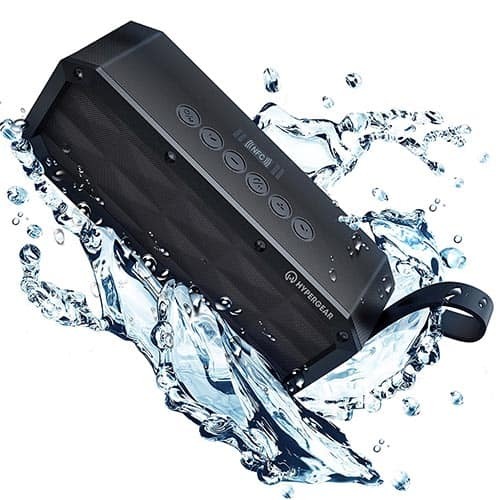 Talking about its durability, this outdoor Bluetooth speaker is the IPX6 rated speaker that makes it water resistant that can tolerate any splashes, pressurized jets & waves of water but hey, don’t submerge it in water. HyperGear Beast XL comes with 6,600mAh battery and you can enjoy 16 hours of wireless playback, non-stop. Need a powerful outdoor Bluetooth speaker? Go get it. The name itself is enough for the introduction. But anyway, here is what Sharkk Commando+ holds inside it. 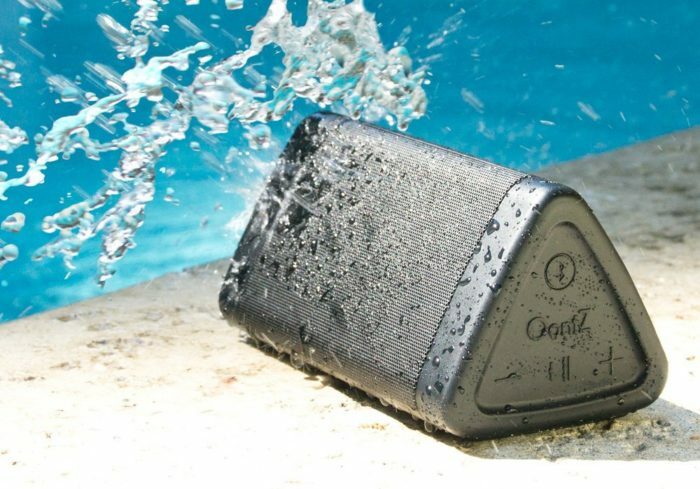 The Sharkk Commando+ Bluetooth speaker has a plastic coating over it which makes it dustproof and IP65 rating makes it waterproof which can bear the rain, water, splash, sprays but don’t submerge it in water. The Sharkk Commando+ comes with massive 6,600mAh battery that also acts as Powerbank for charging external devices and provides you juice for 16 hours of uninterrupted playback. For audiophiles, there is advanced EQ setting that allows you to adjust the sound according to the genre of music. There is two variant of Sharkk Commando+ Bluetooth speaker. One is 20 Watt speaker and another one is 10 Watt speaker. If you need a really loud speaker, go for 20 Watt Sharkk Commando+ Bluetooth Speakers, else 10 Watt is good to go. Both the variants have same features and both are equally durable. Anker is one of the best manufacturers of Bluetooth speakers and smartphone accessories. From the house of Anker, we have a solid, durable outdoor Bluetooth speaker. Anker calls it SoundCore Sport XL. The Anker SoundCore Sport XL comes with Dynamic Stereo that delivers crispy and punchy sound. The dual passive subwoofer (2 X 8W) produces deep and dense bass. IP67 rating makes Anker SoundCore Sport XL waterproof, dustproof & shockproof. The Bluetooth speaker has a Bluetooth connection strength up to 66ft which is really impressive. Apart from that, Anker also claims that their Bluetooth speaker comes with high-capacity lithium ion battery which is industry leading in power management and SoundCore Sport XL offers you 15 hours of non-stop playback (playtime varies according to Volume level). This Anker SoundCore Sport XL Bluetooth Bluetooth speaker is one of my favorite Bluetooth speakers and I would also like to recommend you. Talking about the rough and tough bad boy, Fugoo Sport is here for you. 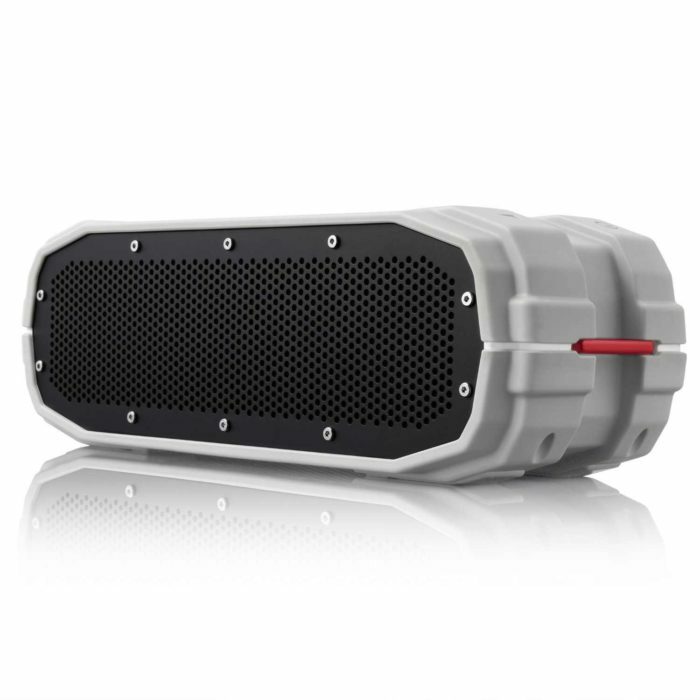 This is one of the roughest and toughest outdoor Bluetooth speakers which is ready for any climate or circumstance. 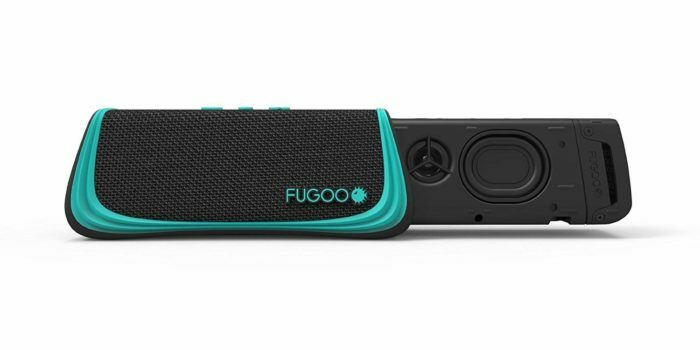 The new rugged sport model of Fugoo Sport Bluetooth speaker is now snow proof, sand proof, and waterproof to 3 feet for 30 minutes. So, if you are planning your next trip to sand dunes or for snow skating, taking Fugoo Sport with you for entertainment is always a great idea. 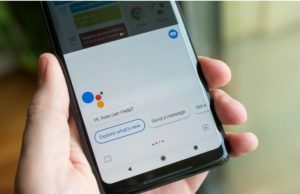 The new variant is now Siri and Google Assitant compatible. Along with durability, the Fugoo Sport is also ready for the pure entertainment experience. It has 6 drivers on four sides for a 360-degree sound experience and incredible 95dB SPL-A volume. Now let’s take about Battery. The Fugoo Sport Outdoor Bluetooth Speaker claims to provide the battery backup of 40 hours at 50% volume level. Now that is MASSIVE & Impressive. With IP67 rating, Fugoo Sport is 100% waterproof, snow, dust and mud proof which makes it super durable for any possible circumstances. All the above-mentioned features are enough for this bad boy. Here is a friendly suggestion, if you need a value for money outdoor Bluetooth speaker, simply go for it. If you are looking for something premium in the outdoor Bluetooth speaker, here is Bose Soundlink Color 2 for you. Talking about Bose Soundlink Color 2 sound quality, sound delivered by Soundlink color 2 is loud and clear, enough to rock the room. The sound is great and you will get the bass delivery with clean and crisp mids and high. Now let’s talk about the durability. So, the thing is, if you need an outdoor Bluetooth speaker with no to somewhat of durability, Bose Soundlink Color 2 is great. You can carry it neat the pool, rain but don’t submerge it in the water. 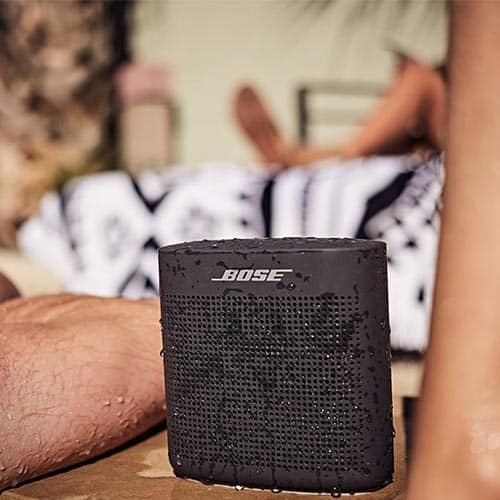 The Bose Soundlink Color 2 has soft-touch silicone exterior that makes it water resistant, not waterproof. There is an option of NFC for connecting NFC enabled devices. You will get the playback of 8 hours on the full charge which is not impressive while keeping in mind the Fugoo, Oontz in mind but anyway it is decent. If you need premium quality with great sound quality and water resistant outdoor Bluetooth speaker, Bose Sounlink Color 2 is a good pick. Here is another bad boy from UE Roll 2. 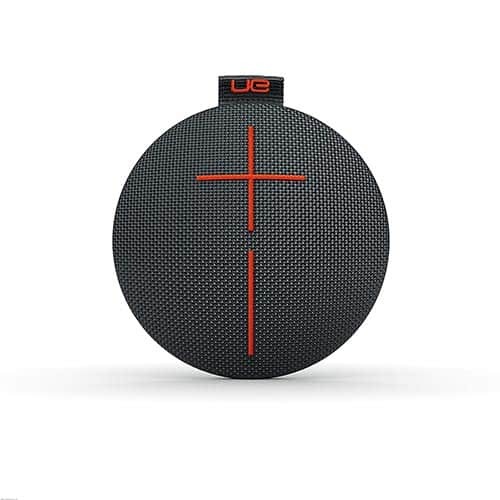 UE Roll 2 is IPX7 rated outdoor Bluetooth speaker that makes it waterproof that can handle the liquid for 30 minutes at the depth of 1 meters but it is not dust resistant, so better watch out. 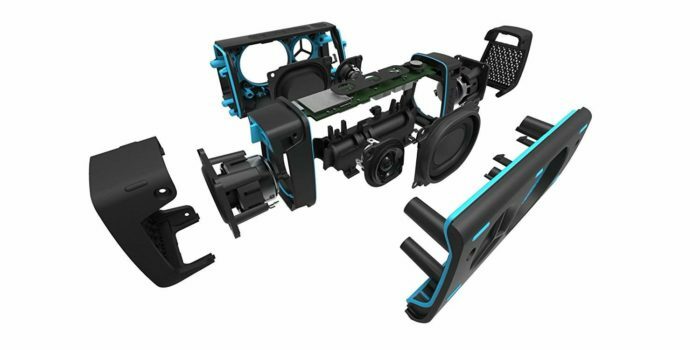 Talking about sound, it comes with One 2″ driver and Two ” tweeters which produce the Maximum Sound Level of 85dBA which is good enough for the small to medium size of the room. You can connect up to 8 Bluetooth devices with UE ROll 2 for streaming music. You can enjoy the continuous playback for 9 hours which is pretty decent. UE Roll 2 is a great Bluetooth speaker rather than Outdoor Bluetooth speaker. The sound produced by UE Roll 2 is phenomenal. It is loud enough to create a happening party vibe. The durability is great for pool and rains but if you are going for extreme situations, Fugoo will be a better companion. So that is all about the best outdoor Bluetooth speakers. All the above mentioned outdoor speakers are super portable and sounds really great. The buying decision all depends on you. If you are getting confused about buying decision, let me tell you, if you are looking for sturdy and powerful outdoor Bluetooth speaker, go for Fugoo Sport or HyperGear Beast XL. Vtin Outdoor Bluetooth speaker is also a smart pick. All are bad boys and ready for any situations. 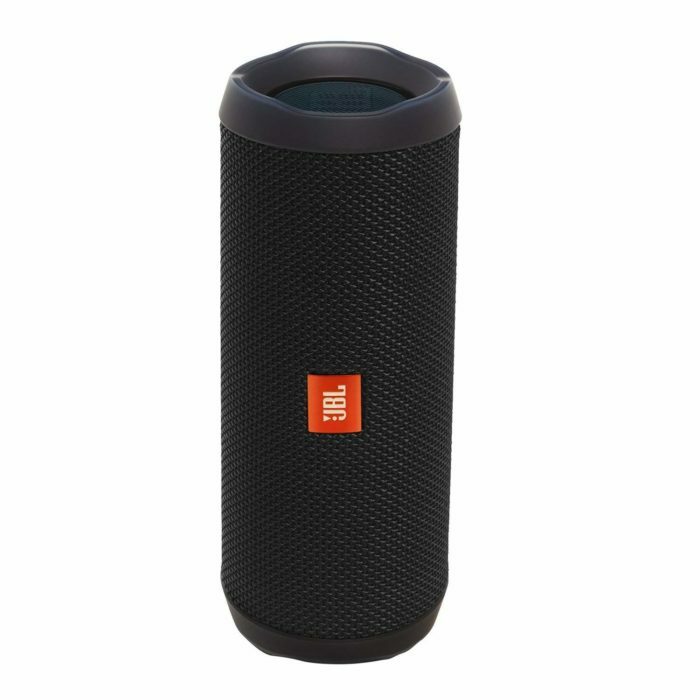 If you are looking for outdoor Bluetooth speaker for pool parties or near water parties, JBL Flip 4, Anker Soundcore, Oontz Angle 3 is pretty good portable Bluetooth speakers for outdoors. On the other hand, if you need premium looking Bluetooth speaker that can bear water splashes, Bose Soundlink Color 2 is for you. All the above mentioned Outdoor wireless speakers are value for money speakers and you can get any of them according to your need. Got any other outdoor Bluetooth speaker? Let me know in the comment section below. I don’t even know how to pick one… they all look the same to me. Wish they had specs of some sort so I could compare them objectively.